What breaks your heart? This is the question Dean (lead pastor at North Ridge) asked on his Facebook page this week. As you can imagine, asking a question like this on a public forum generated a huge variety of answers. I saw answers referring to apathy, marriage, priorities and they continued on. I answered the question with this; any expression of selfishness, no matter how insignificant. This is about as close to a “Sunday school answer” one can get, but it is my gut response to the question. Asking this got our minds thinking about what makes us long for change, which led into today’s message. Craig Goeschel refers to the situation that inspires people to action as their “Popeye moment”. Whatever it is that breaks your heart, that is the motivator for the Popeye in you. The start of Nehemiah lays out a Popeye moment in Nehemiah’s life. The setting is 400 B.C. Jerusalem, the Jews are on their return trek from exile in Babylon and the temple lays in ruins. Nehemiah, a cup-bearer to the king, learned of temple’s state and wept in prayer because he understood it was the unfaithfulness of his community that created the dire situation where they found themselves. Seeing the temple in ruins was Nehemiah’s moment, it broke his heart. He cracked open a can of spiritual spinach and wept, praying through his tears. Nehemiah saw something needed to be done and his immediate response was to pray that God let that someone be him. We should respond the same; someone ought to do something and it might as well be me. Once we are confronted by an action, an ideal, a cultural norm that breaks our heart, it is our responsibility to respond, or not. Why doesn’t someone else see the need and respond? Why should I? You might be tempted to ask this of yourself. The answer is simple; because God gave it to you. Changing the world requires three key actions. First, allow your heart to break. Second, respond. Last, commit to rebuild. Nehemiah’s heart broke for the destroyed temple, he responded by petitioning God in prayer and then the king in his court. After obtaining the blessing of the king and in the face of public opposition, he rebuilt the temple walls. Today’s drawing is inspired by a photograph that has spread across social media, blogs, and photograph showcases across the internet. The shot is of a bubble, the exact moment it is popped by an intruding finger. The image itself is quite captivating. The timing and clarity of the shot impressive as well. My drawing is a recreation of this image, portrait instead of landscape and the bubble is earth. Written over the hand is the question that led into the point of today; what breaks your heart? Changing the world requires some level of destruction; dismantling a broken system, questioning a misguided philosophy, invalidating an crucial aspect of a culture’s world. The hand’s pointing finger impedes on the world to burst the bubble it’s become. Even righteous destruction is not without pain. The splash of liquid strewn as the membrane breaks represents the tears of broken hearts; or, at least one broken heart. 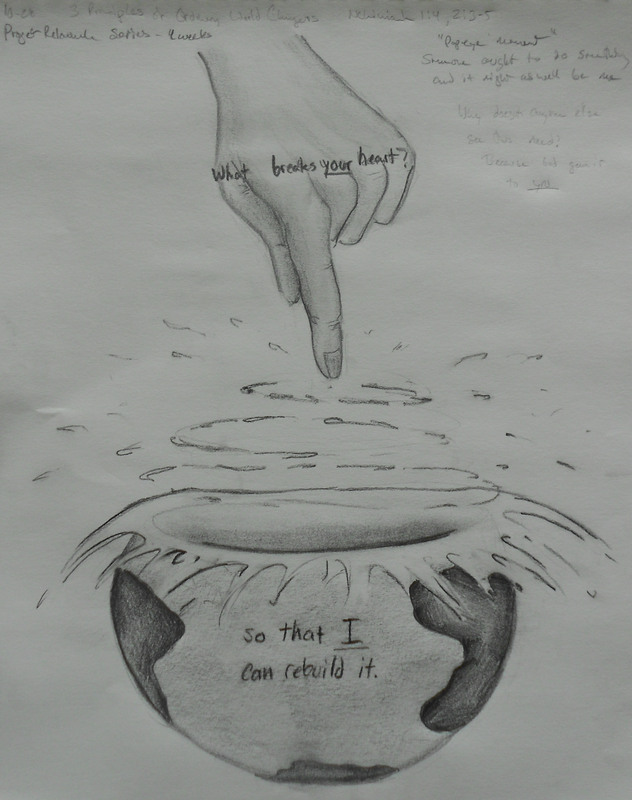 As the world ruptures, the last phrase of Nehemiah’s plea to the king appears; so that I can rebuild it. Inseparable from the responsibility of destroying fallacy is accountability for rebuilding with truth. Only the one who created the destruction can rebuild with sustainable integrity. Why doesn’t someone do something? The someone is you.